The organizational structure of your institution is a key component to a successful implementation. Your institution's organizational structure can be set up either manually or by uploading the organizational structure to FACULTY180. Before setting up the organizational structure, the unit designations and academic terms must be set up in the Details screen. If there is a change to your institution's organizational structure, or if a faculty member switches to a different unit, contact Interfolio to assist with making the necessary changes in FACULTY180. On the Admin section of the navigation menu, click Setup. Click Organizational Structure in the School section.The Organizational Structure screen displays. Click Add Subunit adjacent to the unit you wish to add a unit to. The Add Subunit screen displays. If necessary, change the Parent Unit. Specify the Unit Name and Unit Abbreviation for the new subunit. Specify the administrative rights for the new subunit. (See Define Unit Administrative Access.) 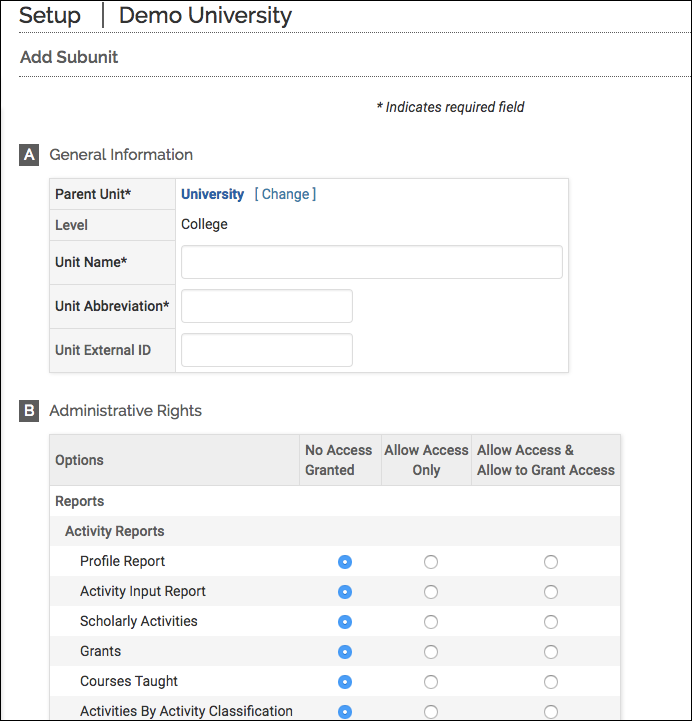 Once unit administrative access levels have been established, your institution is ready to assign rights to individual users. For information about uploading your institution's organizational structure to FACULTY180, see Upload Base Data. Click the Edit icon adjacent to the desired unit.